← Newbie in Graham – Lost! Bruce Lachney’s rhubarb project is offering 2000 pounds of rhubarb, to be picked and sold for a non-profit to feed homeless and displaced kids this summer in the greater Graham area. Volunteers are requested. Contact Carol Wright at (253) 847-9755 or Wayne Cooke (253) 847-4614. Spring into Health Fair will be held April 30th at Eatonville Middle School. It will feature vendors and for-profit merchants who are promoting their goods and services. At the SRC booth at the Fair, an attempt will be made to identify people who would like to start a Self Reliant Community for Eatonville. The Bishop’s Storehouse of the LDS church in Kent is open to non-members on Tuesdays from 10:00 to 6:00 pm. Debbie Pyeatt of a local LDS church, (253) 846-3903, supplied booklets of information on food storage, which contain five ways to get a year’s food stored, what can be refrozen, basic storage for one year, a 72-hour re-freeze checklist, and many more helpful ideas. These are bulk or prepackaged items only, and cash, check, Visa or MasterCard will be accepted. For any other items, contact LDS in your area to sign up to go when the LDS group goes. Iodine 131 radiation concerns were discussed by Anuttama Budd. It’s important not to trust too much in news reports about contamination since authorities are protecting corporations in general and the milk industry in particular. The iodine 131 isotopes, which are a component of fallout, may not be damaging if ingested in a small amount for one day, but when absorbed daily over a month they may cause health problems. To avoid contamination, Anuttama recommended keeping animals’ water out of the rain, and covering leafy vegetables in the garden with plastic. 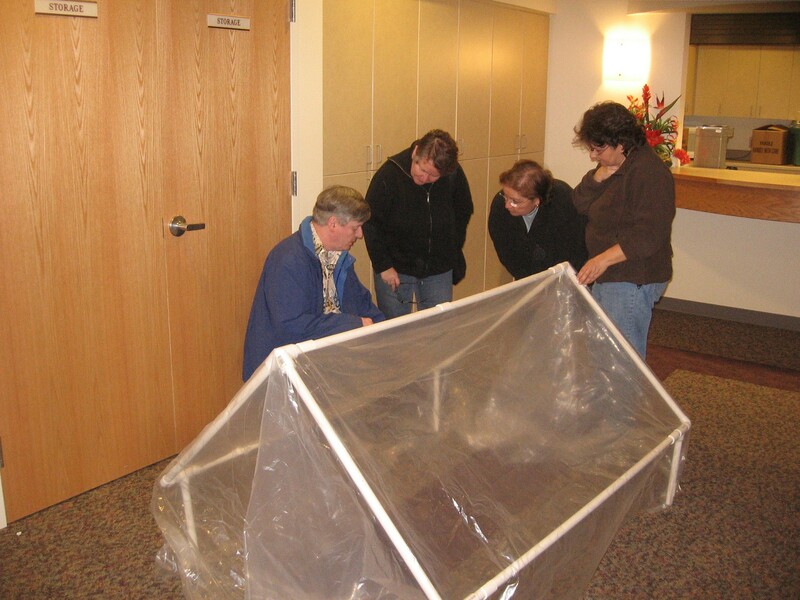 Members of the Self-Reliant community examine a PVC pipe and plastic sheeting cloche for protecting veggies in early spring plantings. The documentary, “The Future of Food” is going to be shown as a fundraiser by The Friends of Pierce County at the Tacoma Grand Cinema, at 606 South Fawcett, in Tacoma, on April 19h at 6:00 p.m. Funds go to help the Friends o f Pierce County fight unscrupulous developers. A silent auction will be held. At the Twin Firs Mobile Home Park (TFMHP) on the Mountain Highway across from Wal-Mart, some residents have developed expertise in the use of ham radios. They have taught firemen how to use them, and TFMHP is preparing to serve as back-up for all Pierce County. Mormons have been preparing for the Big One by having two years of water and food stocked. They, too, have been building a ham radio network that could be an internal community system outside public agencies. Steve Bailey (DEM) said that buildings erected in the 1950s and 1960s were not built to withstand 9.0 earthquakes. From 1980 and on codes were better. The need is to assure that stick-built houses have their floor joists fastened with J-bolts to the foundation footings. Manufactured homes should be anchored with tie-downs. 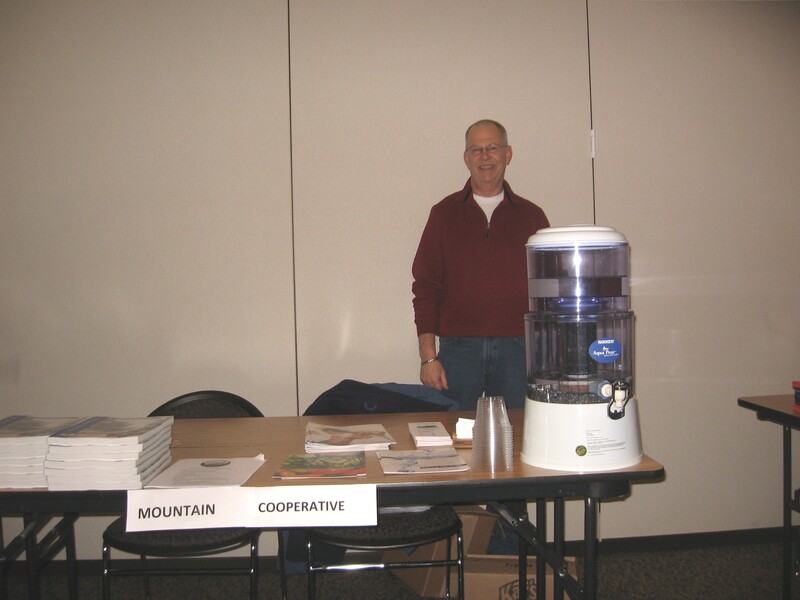 Frank Coobs, president of the Mountain Community Co-op, was at the Self-Reliant Community meeting. Mountain Community Co-op representative, Frank Coombs, reported that the co-op, which started 6 years ago in Eatonville, has a storefront at 105 Carter Street which offers natural and organic groceries and produce, local milk, honey, eggs and beef, dairy products, and gentle personal care items, to name a few. (360) 832-COOP (2667), or at www.mountaincommunitycoop.wetpaint.com. Seed Saver graduate Bill Budd reported on his year-long course on seed saving. Bill said the South Sound Seed Savers (S4) educational program is complex and in-depth, and he highly recommends it. Meetings are held in Yelm on the second Mondays of the month, with classes from 6:30 to 8:30. Mailing Program: Wayne Cooke reported that he sent out a report on last month’s meeting to 20 people – thirteen to members without e-mail, and seven outside our group who are interested. Also, Karelina Resnick said that she will be setting up raffles for future meetings to raise money for the mailing. Cost will be $1 for 1 ticket, or 6 tickets for $5. Bring donations. Sky is donating a rain barrel for next month’s door prize. A 4.2 earthquake was reported on the news in Ashford at 10:45 am Wednesday. Mother Earth Magazine has a free garden planner available on-line, Margie Pratt reported. Laundry soap making classes will be held at Lynn Worley’s home next Tuesday, April 12th. Call (253) 209-2625 or e-mail at charmaineworley@yahoo.com for information and to sign up. Sign up for SRC e-mails. Holly will no longer be sending them out unsolicited, so, if you want an automatic email alert every month, please “subscribe” for that service on the SRC web site. It’s free. Classes are starting at the Free University, which is located in South Hill. Karelina Resnick and others recommended several of the classes. In addition, they said that if you wish to share your skills and talents this is a good place to do it. Borton Garden is being made available to those who need space for a garden, or for members who would like to learn from an expert… Contact Wayne Cooke at (253) 847 4614. The next SRC meeting will be May 4th at the Graham Fire station on 70Th Avenue. 6:30 pm. 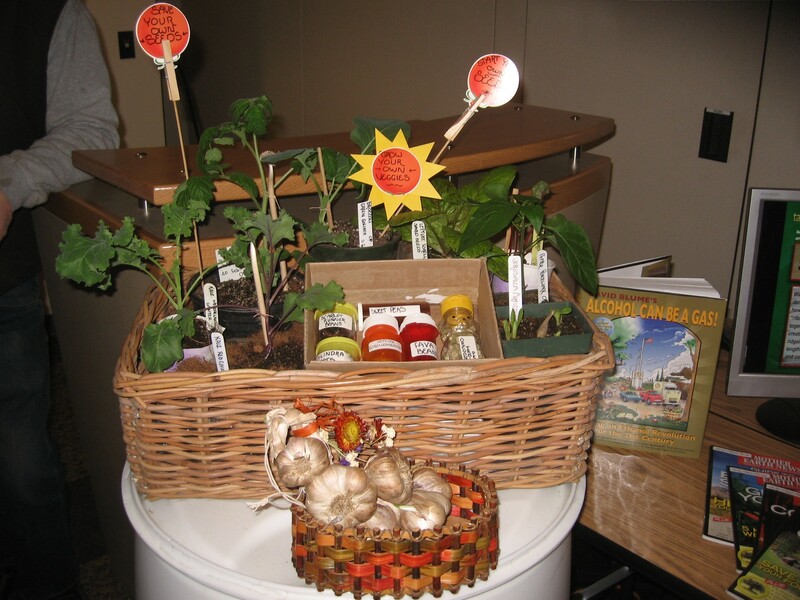 This entry was posted in Eatonville News, Graham News, Self Reliance. Bookmark the permalink.